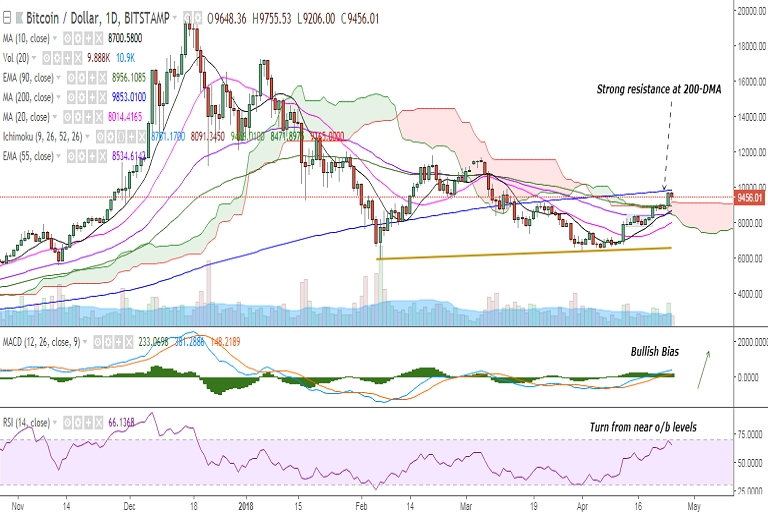 BTC/USD is trading in the red at 9450 levels (at press time) on Wednesday as it faces strong resistance at 200-DMA (Bitstamp). On the topside, a break above 9853 (200-DMA) would further drive the pair to 10000/10562 (78.6% retracement of 11688 and 6427.16). Further strength would target 10718 (1w 20-SMA)/11000/11171 (38.2% retracement of 19666 and 5920.72). On the downside, support is likely to be found at 9193 (1h 50-SMA) and any violation would drag the pair to 8956 (90-EMA)/8703 (10-DMA). Further weakness would test 8471 (Cloud bottom)/8016 (20-DMA). Momentum studies: Overall bias appears bullish with MACD line above the signal line, the pair holding above cloud, and 10- and 20-DMA biased higher. However, RSI is showing a turn from near overbought levels and the pair faces strong resistance at 200-DMA. A break above 200-DMA, coupled with a rollover of RSI to the overbought zone, would confirm further bullishness. Call Update: We recommended staying long in our previous call. All the targets have been hit. Recommendation: Good to go long on break above 200-DMA. SL: 9000. TP: 10000/10550. EconoTimes reached out to crypto experts for their views on the slump seen in bitcoin price in the last quarter and the recent recovery. They pointed to a number of factors ranging from tax payments, to SegWit implementation, to regulations, to growing institutional interest, among others. “In addition, the ‘bad news’ of potential regulation has already been factored into the price, yet in my opinion the fact that the two-year battle over how to scale bitcoin and keep the fees low having been solved by SegWit implementation has not truly been addressed. Adoption keeps rising, usage keeps rising, and the vast majority of trades on exchanges now are buys. That all adds up to rising price until it meets resistance or profit-taking,” Terpin said. “At the peak the entire cryptocurrency market cap was about 800 billion USD. We are at about 420 billion now, off of a low of about 250. I predict by 2020 we will have a 2 trillion market cap at least, which means that the prices of most decent cryptocurrencies are going to go through the roof… including Bitcoin. However we also have to note that Bitcoin dominance as a percent of the entire cryptocurrency market is at a near all time low of about 37%, down from 85% in January 2017. Bitcoin is really crashing, but in such a massively up market does anyone notice?" Taplits added. Kesem Frank, Chief Operating Officer at AION and Co-Founder at Nuco, reflected on the constructive efforts to establish clear rules by global regulators, which in turn is driving institutional interest in crypto markets. "Last week, in its Statement of Priorities for FY2019, the Ontario Security Commission emphasized the cryptocurrency domain as a priority. This could be read along a new Canadian rule expected to take effect on June 12, extending a (much) more liberal model of securities resale outside of Canada. According to the new role, even if we accept at face value the interpretation that cryptocurrencies are securities, Canadian residents who acquire securities of foreign issuers in prospectus-exempt transactions will be able to resell those securities without a prospectus and without further resale restrictions as long as they do so on a market or exchange outside Canada. This is a significant shift, that can explain heightened institutional attention to cryptomarkets,” Frank said. “Readers need to understand that the cryptocurrency industry is still in its infancy. The ups and downs of bitcoin pricing are largely due to the fact that it is still mostly a financial instrument. However, due to the overwhelming promise of blockchain technologies, I believe the long-term trend will continue to be upward. As cryptocurrencies gain more and more mainstream adoption, values will consistently climb while the market as a whole will become less volatile,” Ken Sangha, CEO of OPEN.